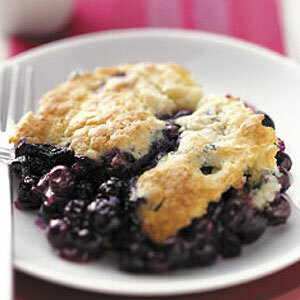 Blackberry cobbler is a Southern treat that brings smiles to the faces to anyone who loves fresh berries. 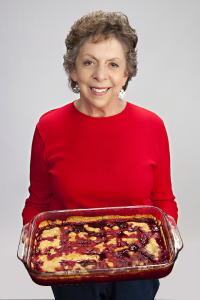 Loretha Riales has developed a tried and true recipe that’s easy to make and a blast to serve at any potluck. Place blackberries in 9 inch by 13 inch baking dish. Combine sugar and tapioca, sprinkle over berries and mix well. Top mixture with bits of butter. Mix flour and salt and cut in shortening using a pastry blender or food processor until mixture is “mealy” and shortening is well distributed. Sprinkle mixture with a small amount of ice water and blend with fork. Add more water as need until mixture forms a ball. Handle the dough as little as possible. Turn out onto floured surface and roll out in a rectangle large enough to cover the dish. Roll dough onto rolling pin and unroll over baking dish. Seal sides of dough to dish and cut small decorative slices in dough to vent steam from the filling. Bake in 400° oven until fruit filling is bubbly and crust is GB&D (golden brown and delicious) 30–45 minutes. Remove from oven and allow cobbler to cool on wire rack for about 20 minutes to give the filling time to thicken. Serve warm with whipped cream or ice cream. Loretha Riales and her husband Roy live in Bailey near Bonham. They are the parents of two adult children and two teenage grandchildren. Loretha is an artist whose principal medium is printmaking. Her hobbies are gardening, sewing, reading and volunteering as an art teacher in the Bonham ISD. This is the only way to make blackberry cobbler, in my opinion! These recipes with flour and sugar and milk just aren’t the blackberry cobbler I have always known and loved.